Every other year, we bring top-tier writers to JMU to present workshops for undergraduate and graduate students, who travel from all over the United States to attend. 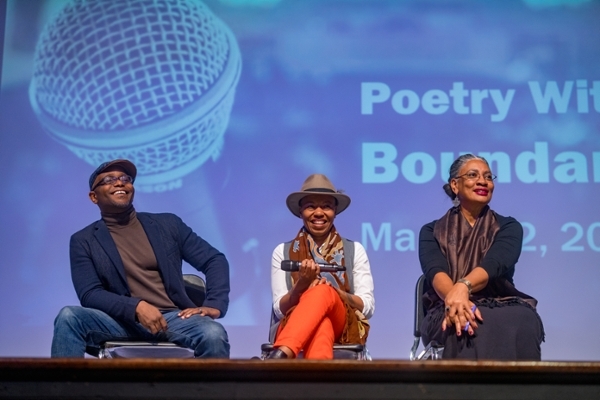 In 2018, we welcomed Pulitzer Prize winner Tyehimba Jess, the former Poet Laureate of Louisiana, Brenda Marie Osbey, and the Civic Poet of Seattle, Anastacia-Renee. From March 22-24, over 50 graduate and undergraduate students from JMU and surrounding universities explored "Poetry without Boundaries" and how it reaches across geographical borders and beyond conventional literary and ideological boundaries. The next Collegiate Summit will be held in the spring of 2020.